"Rock out with your glock out." Saban Films has debuted the first official trailer for an action comedy called Gun Shy, formerly known as Salty (which is the title that appears on the very early poster art seen below the trailer). 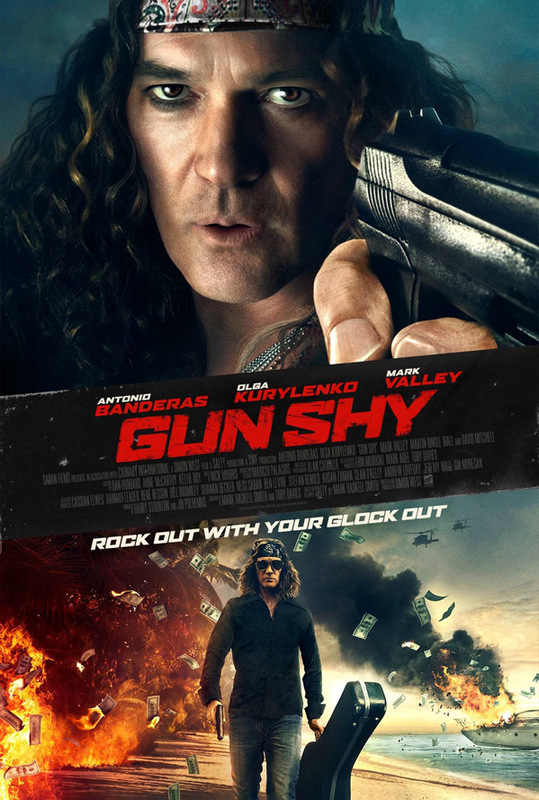 The movie stars Antonio Banderas as an over-the-top rockstar named Turk Henry, with a wife played by Olga Kurylenko. She gets kidnapped while the two are vacationing in Chile, and Banderas recruits some wacky people to help him find and free her. Sounds like a fun straight-to-VHS concept for an action movie, why not. The full cast includes Ben Cura, Mark Valley, Aisling Loftus, David Mitchell, Jeremy Swift, and Jesse Johnson. This really looks ridiculous, but it may be a fun beer-and-pizza rental. When vacationing in Chile, an aging and pampered rock star’s (Antonio Banderas) supermodel wife is suddenly kidnapped by renegades. Unable to navigate more than ordering a sandwich from room service, now he must take to the backstreets of Santiago in this hilarious caper that is as entertaining as it is hair-raising. Gun Shy is directed by veteran English filmmaker Simon West, of the action movies Con Air, The General's Daughter, Lara Croft: Tomb Raider, When a Stranger Calls, The Mechanic, The Expendables 2, Stolen, Wild Card, and this year's Stratton as well. The screenplay is written by Mark Haskell Smith and Toby Davies. Saban Films will release Gun Shy in select theaters starting September 8th this fall. Anyone?